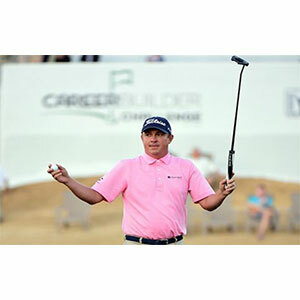 The 38-year-old Dufner won for the fourth time and the first since the 2013 PGA Championship after outlasting David Lingmerth in a play-off. The Swede, who closed with a 65, found the water at the 18th to gift Dufner the title. Both players finished on 25 under and Dufner will look back on a stroke of luck at the 71st hole in helping him to finally land another victory. He pulled an 8-iron and thought it was wet only to find it in a sandy area in among the rocks. His hooked chip then struck the flag and stopped inches away. On the first extra hole Dufner holed from 11 feet to save par and then Lingmerth found a grass bunker, and then the rocks and finally the water. Phil Mickelson shot a 68 to tie for third in his first start since The Presidents Cup in October and first since splitting with swing coach Butch Harmon to work with Andrew Getson. "It's a shot that I've hit some, not in the hazard, but something similar. You kind of hit that low little spinning one with some check on it."